Marine animals, plants and fish oil supplements contain healthy fatty acids. These fatty acids are known as omega-3 fatty acids, which have been linked to a wide range of health benefits. You can get omega-3 fatty acids from sources other than fish, but fatty fish and fish oil have the highest amounts of these beneficial nutrients. Omega-3 fatty acids are short-chain and long-chain polyunsaturated fatty acids. There are three main long-chain fatty acids, DHA (docosahexaenoic acid), DPA (docosapentaenoic acid) and EPA (eicosapentaenoic acid), that have been linked to health benefits. When you purchase fish oil pills, the fatty acid content of EPA and DHA is usually listed. These fatty acids have been linked to the most health benefits. When buying fish oil pills, always look at the omega-3 fatty acid content. It can vary substantially. Amounts of EPA and DHA are known to vary between manufacturer and supplement type. A typical fish oil supplement provides about 1,000 mg fish oil, containing 180 mg EPA and 120 mg DHA. However, extra strength variants can be much higher, with as much as 504 mg EPA and 378 mg DHA in each 1,400 mg fish oil capsule. Omega-3 fatty acids are in a lot of different foods, so you're likely getting some amount of these beneficial fatty acids each day naturally. The Dietary Guidelines for Americans recommends 1.1 to 1.6 grams of omega-3s each day. However, this refers to all omega-3s, not just DHA, DPA and EPA. 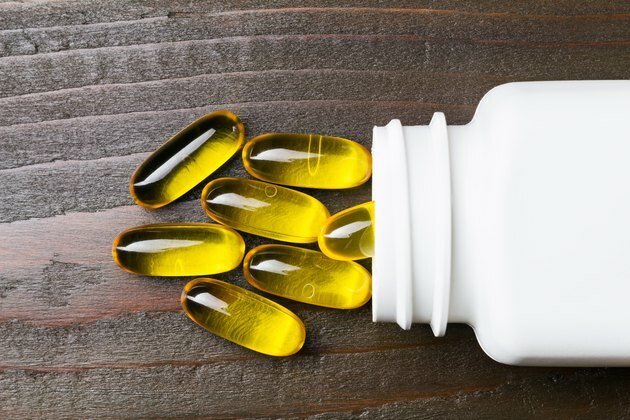 People who don’t consume one to two portions of fatty fish each week may benefit from fish oil pills in order to increase their consumption of EPA and DHA. Like with all supplements, you should be careful not to take too much. The FDA recommends not more than 3 grams of combined EPA and DHA per day, while the European Food Safety Authority recommends doses as high as 5 grams per day. Some clinical studies have used even higher doses. In general, you should get only about 2 grams of omega-3 fatty acids from supplements. Before you start taking fish oil pills, consult your doctor to find out how much omega-3 you need. The omega-3 fatty acids in fish oil have been associated with many health benefits. EPA and DHA have been used to help treat cancer, cardiovascular issues, diabetes, digestive system disorders, eye diseases, neuropsychological issues, respiratory conditions and rheumatological disorders. The amount of omega-3 used to treat all of these conditions ranges substantially. However, in general, fish oil pills with high omega-3 content have been safe and effective ways of improving overall health. Omega-3 supplements have very few side effects. Typically, omega-3 comes from marine sources, like fish oil, but it can also come from marine plants. Because of their sourcing, fish oil pills can give you fishy breath or burps. In fact, the most common side effects of taking omega-3 supplements are fishy breath and indigestion. In high doses of 900 milligrams EPA and 600 milligrams DHA, fish oil side effects include a reduced immune function and increased bleeding. Always consult your doctor before taking high doses of omega-3 fish oil pills.